A microbial product to clean up toxic waste including hydrocarbons, salt, pesticides, oil, sewage, fracking waste, grease traps, septic tanks and sewage. Oil production can be greatly enhanced with Elementally Green’s Environmental Clean Up by producing atomic oxygen that can go farther down the well than the standard hot oil treatments, commonly used to liquefy the paraffin. These oxygen-producing microbes work in hostile environments where there is reduced or no free oxygen. When we inject these microbes down the well they are able to consume salt and increase available oxygen. They work in tandem to refine and loosen by permeating the rock wall and the oil. Not only is the paraffin loosened and refined, so is the oil. It creates natural carbon dioxide and a natural detergent effect on the oil and paraffin. Many of the wells could produce 30 to 40 percent more oil. In some cases, oil flow increase has been observed in some cases 200 to 300 percent. Past studies were conducted by the US Department of Energy verifing that microbes can boost oil production. The industry calls this type of microbial boosting oil production MEOR for Microbial Enhanced Oil Recovery. For site clean of oil, gas, diesel and many other forms of toxic spills. We offer products to help you clean up these areas by treating the soil on site. On site is better than moving the soil to another area possibly exposing you to contamination elsewhere. On request will have our commercial treatment experts visit the site and find a proper solution for your problem areas. Fracking water is a sensitive concern within the oil industry. Elementally Green’s Bioremediation Formula can clean up this toxic water, reducing contaminated water sources.​ Fracking chemicals in ground water, lakes, rivers and aquifers have been documented. 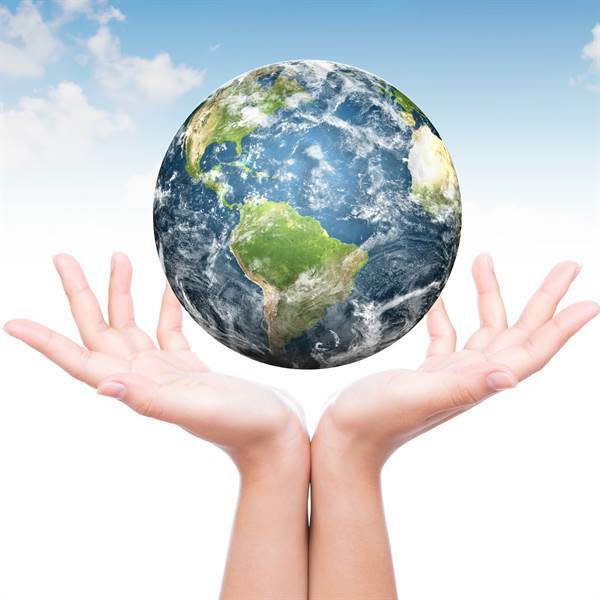 Exploring our Bioremediation solution can help reduce or eliminate these dangerous effects to humans, animals and the environment. Bacillus Pummels functions as a plant growth-stimulator and produces a resistance to fungus. Bacillus Safeness is salt tolerant, which can help plants, soil and water survive in heavy metals, salt, chemicals fertilizers, pesticides and toxic exposure. Bacillus Subtilis is resistant to unfavorable environmental conditions such as drought, salinity, extreme ph., radiation, and solvents. It acts as a natural antibiotic to soil, plants and water. Bacillus Clausis has been found to produce an anti-microbial substance that help plants, soil, and water defend against harmful bacteria. Pseudomonas Peli is known for the ability to neutralize toxic substances i.e. benzene, toluene, ethylene, acetone, diesel fuel, eimdthylformanide, gasoline, crude oil, antifreeze, grease, kerosene, aviation fuel, glycols, hydrocarbon waste, Methanol, paint sludge, motor oil, methyl territory butyl ether (MTBE), acrolonite, hydrocarbon waste, organic chemical waste, which poison water supplies from exposure to commercialization, fracking, oil spills and pollution. All of these work together, with many more naturally occurring microbes, to be the biocatalyst to provide this natural clean-up, in such a short period of time. The microbes activate the enzymes to create blue-green algae. These microbes have been used to clean up lakes, ponds and rivers. When applied correctly, it can clean up ocean waters polluted with oil and other toxic substances. At last we have some answers as to how our miraculous products work. EG Environmental Clean Up Takes on Oil & Pollution Spills! 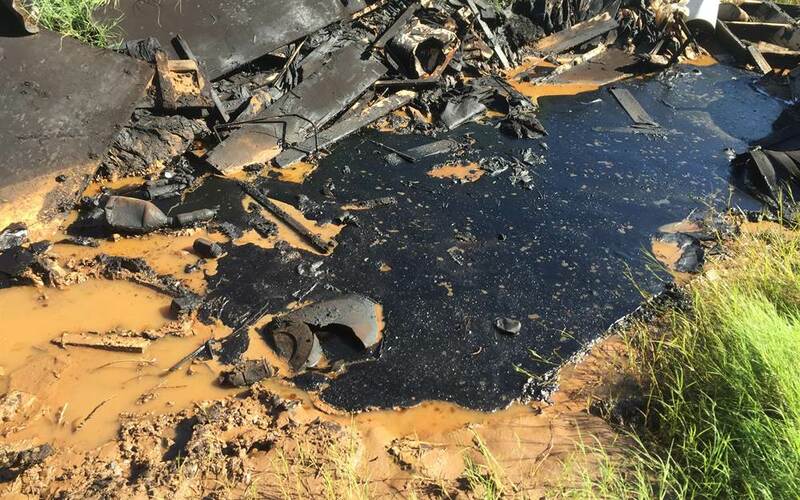 We drove to a property close to Marion, Texas to test our product on a small oil spill. The site was a large 20’ long trash and oil filled ditch. The oil appeared to be fairly deep in most of this man-made ditch which about 5’ high and 10’ wide. After observing the site, we made a treatment plan for the clean-up. The following week we returned to the sight and placed a 300 gallon tank and filled it with water and EG Environmental Clean-Up. We fed the sight with a soaker hoses to keep the sight wet with the solution. 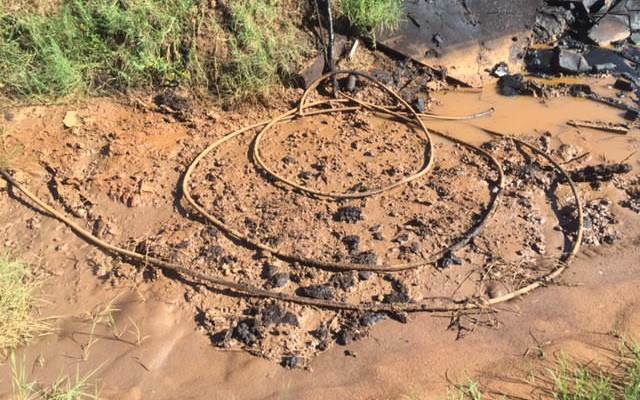 We returned a few days later to find we needed more soaker hoses and more volume of water coming out on to the spill. We made these adjustments and then we checked the project weekly. In August with the extreme heat it was hard to keep the sight wet because of evaporation. We began to turn the soil to find the oil was more than 12’’ deep and deeper in some areas. The soil had to be tilled for optimum microbial activity. The week of August 8 unusual rains began and continued until August 22 and totaled over 6 inches. 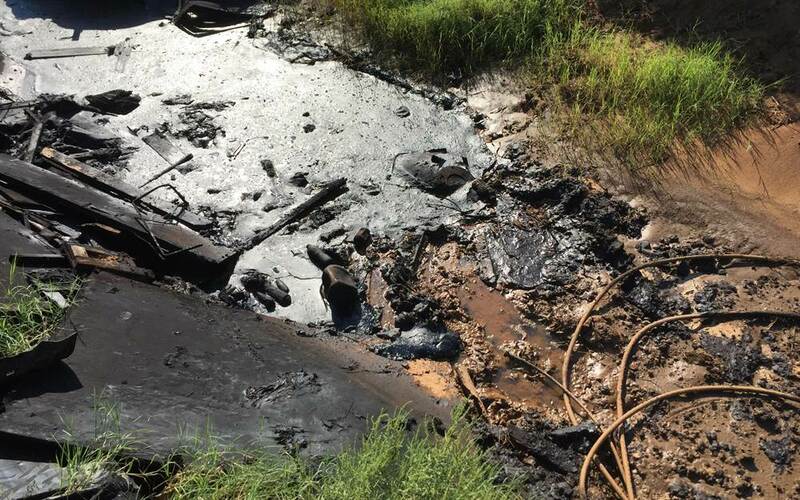 August 25, 2016 we drove to the site to find the oil was eaten around the edges of the pit and in several patches, it was liquefied and beginning to dissipate. By mixing the soil with the oil we knew it would speed up the cleaning process. Some areas still had a hard crust but many areas were turning into a liquid state. We tilled a large patch of the crusted oil area with soil and add the soaker hoses with a stronger solution of EG Environmental Clean-Up Formula. Bi-weekly trips were made to the site. We added some of our special blend of dry microbes to the top of a 5’x5’ section while continuing the infusion of EG Environmental Clean-Up. 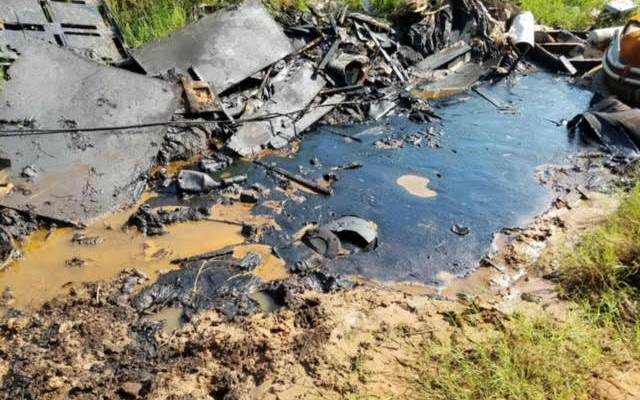 By September 9, the site was clearing and appearing to go under the larger part of the thick oil crust and was loosening and breaking up other areas. 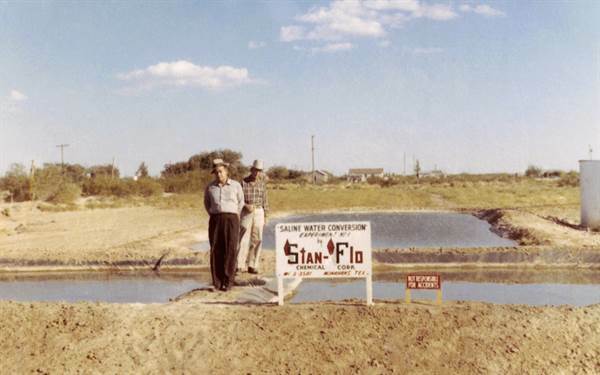 ​Our original company was Stan-Flo and this was a test owe conducted on cleaning up salt water ponds. 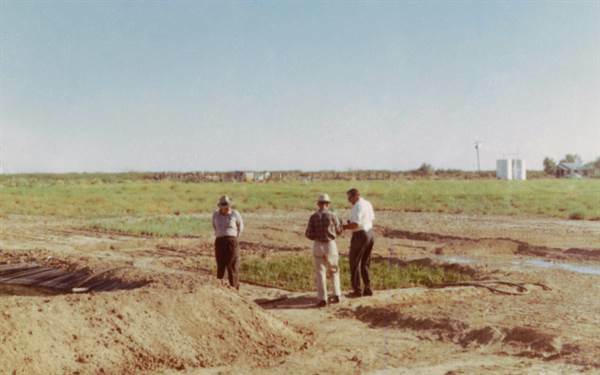 Paul Carr is pictured observing the site and the progress. We were involved in many tests to prove how our process worked. We cleaned up many sewage plants. Read some of our original testimonials many new ones and videos our clients sent us. Immediately after emptying grey tank, use 6 oz. into sink or drain and immediately follow with 30 seconds of warm/hot water. Immediately after emptying black tank, fill toilet with warm water and add 8 oz. per gallon of per 40 gallon tank . Let sit for 1/2 to 1 hour then flush down. 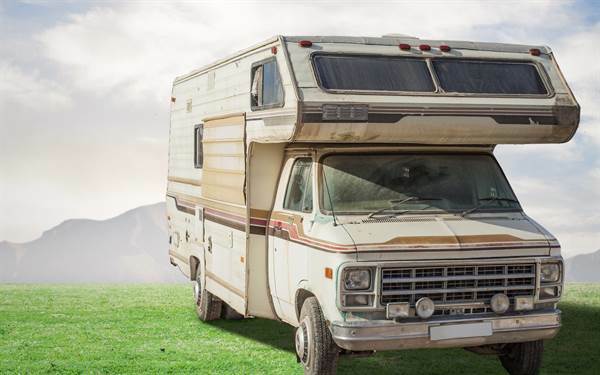 For time usage add 1/2 gallon per 1000 gallons septic systems. Pour the 1/2 gallon in the toilet furthest away from the septic system. For maintence once a month pour 8 oz. per gallon in toilet furthest away from the septic. For first time use 32 oz. per 1000 gallons of septic system. For best results pour in the toilet furthest away from the septic system. Pour at least 1/2 gallon of product down the trap after the last usage. Wait at least 2 to 3 hours before before normal usage.